Dawesville MLA Kim Hames, Ocean Road Primary School principal Ashley Mottershead, head girl Ella Kiddey and head boy Connor Freshwater (Year 6). 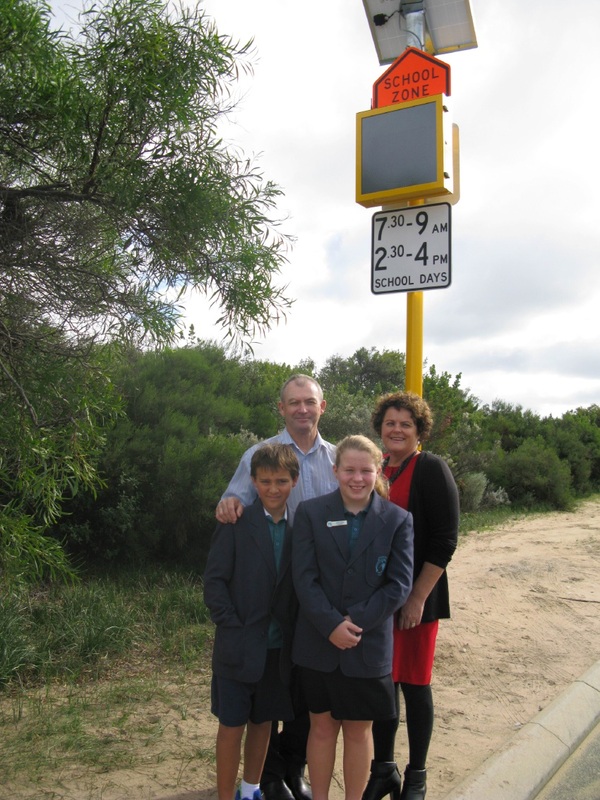 OCEAN Road Primary School is one of many schools to have flashing electronic school zone signs installed. Dawesville MLA Kim Hames said a record number of WA schools had flashing 40km/h Electronic (LED) School Zone signs installed. The State Liberal National Government committed $36 million to install the signs to all eligible WA schools – a total of 1075 schools – by March 2017. “By the end of June, more than 470 schools will have these warning signs installed, which is a great outcome to help keep our children safe” Dr Hames said. The funding comes from the Road Trauma Trust Account, which is funded by fixed camera, red light and speeding fines.